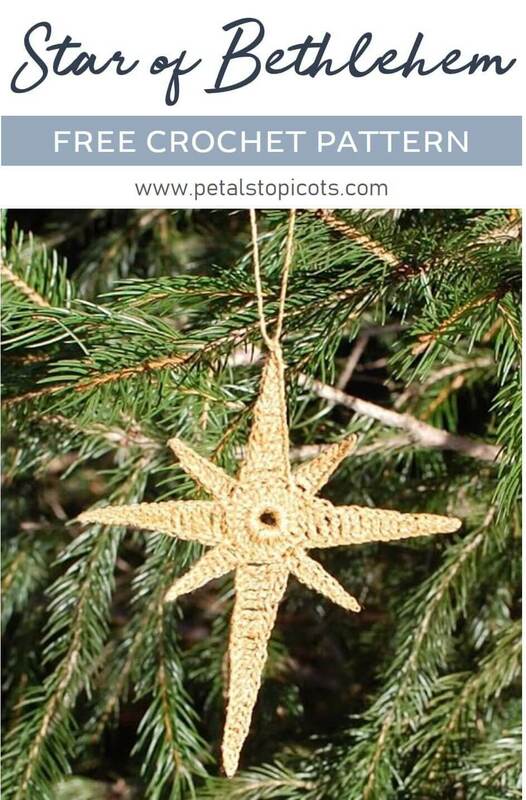 Crochet up this Star of Bethlehem Crochet Pattern to decorate your tree, top your nativity display, or gift to friends! Extended Double Crochet: Yarn over hook, insert hook into specified stitch and draw up a loop, yarn over and draw through first loop on hook, yarn over and draw through two loops on hook, yarn over and draw through two loops again. Finished star = approx. 5 in. x 4 in. Double Treble Crochet: Yarn over hook three times, insert hook into specified stitch and draw up a loop, yarn over hook and draw through two loops, yarn over hook and draw through two loops twice more. Ch 8, join with a Sl st in first chain made to form a ring. Foundation Round: Ch 3, work 24 dc into ring, join with Sl st in top of beginning chain — 24 sts. Point 1: Ch 16, Sl st into 2nd ch from hook, 2 sc, 3 hdc, 3 dc, 1 edc, 3 tc, 2 dtc, skip next 3 sts on foundation round and Sl st in next to anchor point — 15 sts. Point 2: Ch 9, Sl st in 2nd ch from hook, 2 sc, 2 hd, 3dc, skip 1 st on foundation round and Sl st in next to anchor point — 8 sts. Point 3: Ch 16, Sl st into 2nd ch from hook, 2 sc, 3 hdc, 3 dc, 1 edc, 3 tc, 2 dtc, skip next 3 sts on foundation round and Sl st in next to anchor point — 15 sts. Point 4: Ch 9, Sl st in 2nd ch from hook, 2 sc, 2 hd, 3dc, skip 1 st on foundation round and Sl st in next to anchor point — 8 sts. Point 5: Ch 23, Sl st into 2nd ch from hook, 3 sc, 4 hdc, 4 dc, 2 edc, 4 tc, 4 dtc, skip next 3 sts on foundation round and Sl st in next to anchor point — 22 sts. Point 6: Ch 9, Sl st in 2nd ch from hook, 2 sc, 2 hd, 3dc, skip 1 st on foundation round and Sl st in next to anchor point — 8 sts. Point 7: Ch 16, Sl st into 2nd ch from hook, 2 sc, 3 hdc, 3 dc, 1 edc, 3 tc, 2 dtc, skip next 3 sts on foundation round and Sl st in next to anchor point — 15 sts. Point 8: Ch 9, Sl st in 2nd ch from hook, 2 sc, 2 hd, 3dc, skip 1 st on foundation round and Sl st in same st as join from foundation round to anchor point — 8 sts. Wrap a flat piece of Styrofoam or thick cardboard with wax paper and tape to secure. Using straight pins, pin the star right side down onto the Styrofoam/cardboard, making sure to straighten each point. 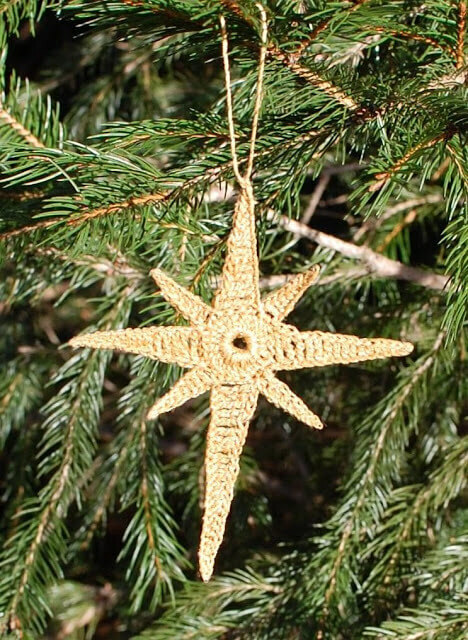 Using a small paintbrush, apply a thin coat of fabric stiffener over the star. Let sit until dry or as long as directed on the stiffening product. Once dry, thread a piece of thread through the top of the star and knot the thread to create a loop. Click here for more Christmas crochet patterns. Previous Post: « How to Make Plarn + Some Fun Plarn Projects! I have been looking for a pattern like this for years! Thank you so much for making it free. I have started one, but am having a little problem understanding where the “anchor point” is. Would you email me and help me out please? I love your star. I’m thinking I would like to make one to put on top of my table high Christmas Tree. Would you have any recommendations for me as to larger yarn and hook? Thank you. It really is lovely. Really lovely! I would like to link your pattern from my blog: cherishables-handcrafts.blogspot.com as part of my Christmas Countdown beginning 12/1/12. Thanks! i love this star, it’s such a great look. admittedly, i know nothing about crochet or sewing of any sort, but i am sure i can offer expert opinion on the neat and cuteness of these things, lol. thank you so much for your comment on my blog! your blog is full of inspiration. i love this star!!! i’m following you back! Its so pretty! Love it! Thanks for stopping by my blog today! Thanks SO much for stopping by earlier! I’m glad my gift list was fun for you! I love your star of David!!! SO MUCH! I’m excited to be following you, too!!! PS I’m having my first linky party on 12/13. It will be “Christmas Scape” themed, tablescape ~ landscape or anywhere else in you home that you’ve added a touch of Christmas! I’d LOVE for you to link up! My blog is http://www.itsoverflowing.com/. Lovely star, thanks for sharing! Thank you all for the sweet comments and for following along! Hello! Following you back from the blog hop. I love the star! Happy blogging! Hi…thanks for visiting me! Your blog is great and I will love to follow & maybe learn something! I’m over visiting from Thrifty Thursday. What could be more thrifty than a free pattern? Thanks for sharing – these are lovely! thanks you for coming to my Blog Hop! I would love it if you would link something up to my Made U Look craft & recipe linky too! I am following you back!